Each year, millions of homeowners, restaurants, apartment complexes and other businesses replace their old, inefficient, broken or just plain ugly appliances with new appliances designed to be more efficient and more attractive. New appliances don’t just look better - they perform better and they’re more efficient - and that’s great for the environment (not to mention your own budget). But unlike regular “waste” that can be dragged to the curb and picked up by municipal waste collectors, appliances need to be disposed of in specific ways. 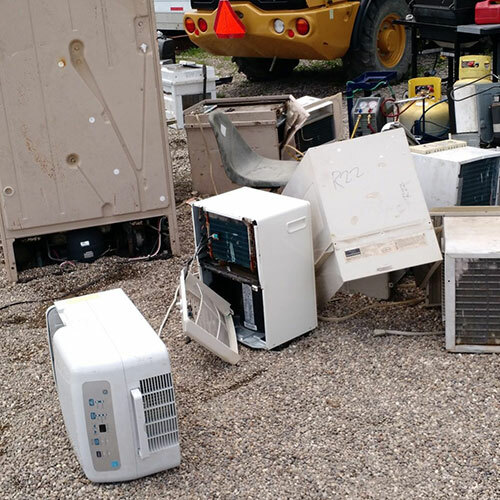 That includes refrigerators, freezers and air conditioners that contain ozone-depleting refrigerants as well as stoves and other “white goods.” Fail to follow the rules, and you could be facing substantial fines. Not only that, but hauling old appliances out and removing them from your property yourself is back-breaking work, especially if you don’t have the right equipment or aren’t aware of the disposal procedures, rules and costs. And, renting a dumpster (not to mention simply finding a place for it) can be a real headache. At Flat Rate Junk Removal, we’ve got the solution you’re looking for. We offer a transparent fee structure that’s based on the size of your load so you know up front what your costs will be. It all starts with a free evaluation and estimate to determine your load size and disposal needs. Our skilled and experienced team handles all sorts of appliances. Plus, we offer complete cleanouts and handle mixed loads, so you don’t have to worry about separating your items prior to hauling and disposal. In NYC? Call Flat Rate Junk Removal now for a free estimate. Flat Rate Junk Removal is a leading appliance removal company in Brooklyn, the Bronx, Queens, Staten Island and Manhattan, offering complete junk hauling services for homes and businesses throughout New York City. Getting rid of your old appliances shouldn’t be a hassle - and it shouldn’t break the bank, either. With Flat Rate Junk Removal, we make junk removal simple, fast and affordable. Ready to get started? Give us a call at 1-800-299-JUNK and schedule your free, no-hassle estimate today.